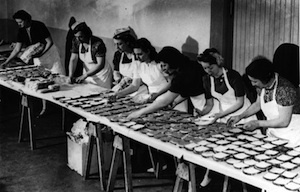 As you might expect from someone who has a serious fetish for vintage cookbooks, pencil skirts, and the music of Sergio Mendes, I'm all aflutter for the recently-premiered third season of Mad Men. For me, the major plotlines take a backseat to the details of dresses, cocktails, and the staggering amount of cigarettes smoked (In an office! At lunch! While pregnant!) by the leading players. How can I concentrate on Pete's marital woes when Joan is in the same room? Why should I care about Bobbie Barrett when Don looks so great in a suit? And how can I really appreciate the depth of Betty's humiliation over her dinner party when I can only think about how much I'd like to recreate her menu? The opportunity came on Sunday evening at a Mad Men-themed premiere potluck party. I knew I had to make something that would double as Retro Recipe fodder, something that not many people think to make now, but that could still be potentially great if brought back and served at a dinner party in 2009. Rumaki fits the bill perfectly: chicken livers and water chestnuts, marinated and wrapped with bacon and broiled in a hot oven. Everyone loves bacon, right? And chicken livers deserve another chance at the spotlight: cheap, easy to cook, and just exotic enough to impress. I rewatched the episode with Betty's party (A Night To Remember, from the second season, if you're interested), and noticed a fateful detail that escaped me the last time: Betty Draper owns a copy of Betty Crocker's Hostess Cookbook (buy at Amazon ), just like me! And even if the first edition of the book came out in 1967, a full five years before this episode took place, I decided to make my rumaki according to what Betty would have done. While Betty asserts that this appetizer originated in Japan, it is in fact decidedly American in origin. It sprang from the 1950s obsession with all things South Pacific in nature, a national zeitgeist from which we also get tiki bars, mai tais, and yes, the musical South Pacific. James Beard attributed rumaki to Vic Bergeron, the enterprising Californian who opened up his first "Trader Vic's" restaurant and bar on San Pablo Avenue in Oakland in 1932. The vaguely Polynesian food, along with cute cocktail waitresses and more Hawaiian décor than you could shake a tiki torch at, was an instant success, and "Trader Vic" opened more restaurants across the US. Years later, there are still some Trader Vic's out there, and plenty of vacationing adults still enjoy a mai tai with an umbrella or two, but rumaki is noticeably absent from menus and parties. A shame, since this bite is delicious and so easy to make. The sauce for marinating rumaki is called "Oriental sauce", which is maybe not the most PC term nowadays, but there's absolutely nothing "Asian-inspired" about this. With ketchup, vegetable oil, soy sauce, and garlic, this recipe reads exactly like a 50s housewife's approximation of Chinese cuisine. I let the livers and water chestnuts soak for about four hours and then wrapped them in bacon. This part was difficult, just because the livers are slippery to begin with. Add an oil-based marinade and toothpicks and it's a miracle more of them didn't end up on the floor. I recommend keeping a vodka gimlet nearby in case you aren't up to the task. The spinach dip was on the table and Heinekens were being opened when I turned on the broiler full-blast, rolled my livers in brown sugar, and set them out on a cookie sheet. Betty Crocker recommended broiling for ten minutes, which I did, but when I took the tray out of the oven my bacon was just a touch burned and the livers a tad overcooked for me. I'd set the timer for eight minutes instead, but otherwise these little livers were the hit of the party: salty, sweet, smoky, plus the crunch from the water chestnut. If we've learned nothing from Swedish meatballs and pigs in a blanket, it's that there's something about cocktail food on a toothpick that can't be beat. So I urge you to take a second (possibly first) look at rumaki. Like Joan herself would say, it looks complicated, but the faux-Polynesian trader who designed it made it simple enough for everyone to make. Pour Oriental Sauce over livers and chestnuts, cover dish with plastic wrap. Refrigerate four hours. Set oven control at broil and/or 550 degrees. Remove livers and water chestnuts from marinade. 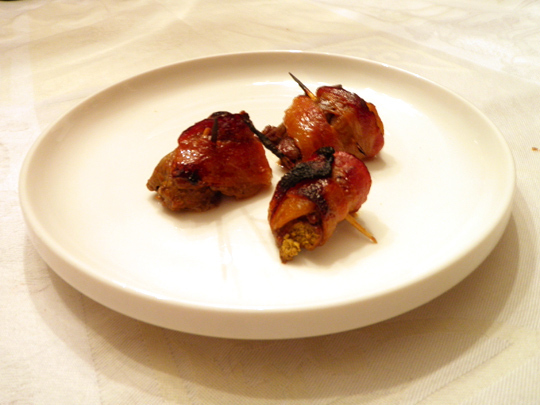 Wrap 1 liver and water chestnut slice in each piece of bacon, secure with toothpick. Roll in brown sugar, broil 10 minutes. Mix all ingredients, makes about 1 cup sauce. My mother made these back in the '60s - they were very sophisticated and very popular, although a little tricky to make. But they are well worth the effort, and nothing says this is a grown-up party like rumaki and martinis. Such a fun idea! Thanks for sharing this "retro recipe"--makes me want to cook a whole retro meal for each new episode of Mad Men! I loved this episode so much too. I have to say I had no idea what Rumaki was, though! I, too, am a Maddict, as well as having a fascination with the 1960's cookbooks my mom used, all things Tiki, etc. 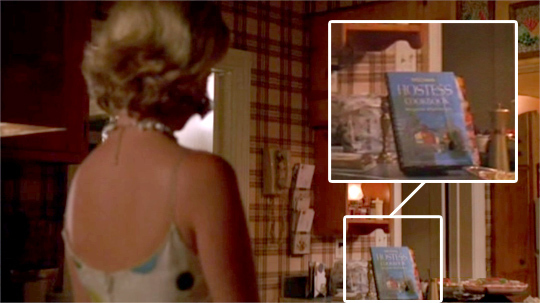 I recently picked up a used copy of the Betty Crocker Hostess Cookbook, not realizing it had been in one of the previous season's Mad Men scenes. How cool! I'm glad I bought it. Anyway, if it was published in 1967, I think you meant that it came out a full five years "After" (not "Before") the specific episode took place. Either way, it was great that you picked up on the detail, and thank you so much for pointing it out. Also, thanks very much for this recipe. 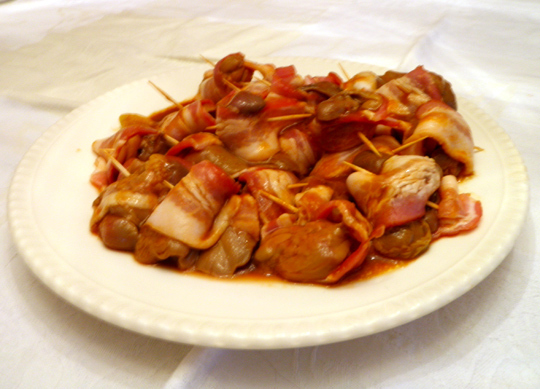 I have had more modern "Rumaki" recently, which is just basically Shrimp wrapped in bacon, but the old-timey Rumaki with the chicken livers is what I remember seeing as a child. Thanks, and please keep up this site, as well as all things Retro and Mad Men!!! Takes me back to my happy childhood days.